For families registered for more than one class or student, payment plans available. Your little one is now moving and exploring the world like never before. With busy little ones in mind, this class will continue to focus on nurturing key areas of developmental. Caregivers will delight in watching their little ones' curiosity and joy making friends and socializing with others. 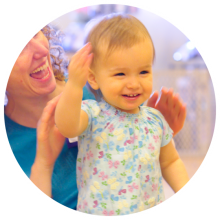 Enjoy a lively environment for independent movers and caregivers, to experience the joy of dance and movement together. Discover movement concepts while gaining balance, flexibility, and coordination with story telling, songs and rhymes, instruments, props, and simple choreography. Intellidance® uses music, dance, social bonding, and play to develop physical capabilities while building sensory integration and critical brain pathways. We use visual, auditory, and kinesthetic methods to learn movement concepts. Movement-based curriculum grows with the child as he/she builds body & spatial awareness, muscle control, body/mind integration, language, confidence, and new skills for discovering the world. Intellidance® is a playful and creative approach to movement education in the early years. Our programs are based on current best practices and recommendations in early childhood development and education, coupled with child and caregiver-approved fun! The program model combines exploration and discovery with dance, music, and play designed to nurture our littlest dancers, while strengthening the caregiver-child bond! Intellidance® instructors are play advocates who empower families by providing simple, accessible experiences that take them from our classroom into their homes.